It is now common practice to use a pressure transducer, with a built-in datalogger, to monitor wells and collect readings during conventional pumping tests. Prior to their use, field technicians and drilling contractors may have spent hours or days on site, taking water level measurements by means of a manual water level meter or steel tape. These manual methods cost extra time and are subject to human error, especially if multiple workers and an array of monitoring wells have to be managed. Continuous monitoring of water level fluctuations is just not efficient when you have to constantly record the data by hand. With instruments like the Solinst Levelogger and AquaVent water level dataloggers, data collection is fully automated. This increases productivity and the accuracy of a pumping test. Solinst dataloggers can be set to record at intervals as small as 1/8 of a second, providing higher resolution data, adding to the value of subsequent data analysis. In literature, you can find basic agreement from a variety of sources on how a pumping test should be conducted, however, there are some specific points to consider before using a Solinst datalogger in order to gain the most valuable data. The Levelogger Edge uses an absolute pressure transducer, while the AquaVent is vented. A Levelogger requires a second barometric datalogger to compensate the water level readings for atmospheric effects. The AquaVent provides data that is automatically compensated for barometric pressure changes. When using Leveloggers during longer tests, and in peripheral wells through unconfined aquifers where the response to pumping may be small, it is especially important to compensate Levelogger data. Using a synchronized Barologger provides the simplest and most accurate method to compensate Levelogger data. The barometric data that Leveloggers record is also an advantage. The data can be used to determine barometric efficiency, which can be very significant, especially in deeper confined aquifers. Both dataloggers use a Hastelloy pressure sensor. The Levelogger Edge comes in six different pressure ranges, and the AquaVent comes in three shallow ranges; you'll have to select a range appropriate to your application. Your datalogger must stay submerged for the entire pumping period, while remaining within specification. Therefore, you need to deploy your datalogger to a depth beyond the maximum expected drawdown. Note, if you are concerned with water quality changes or saltwater intrusion in the pumping or observation wells, Solinst offers the LTC Levelogger Edge, which records water level, temperature and conductivity. The conductivity data is a great indicator of water quality and salinity. When determining the best instrument to use based on accuracy, the shallower the pressure range, the more accurate the readings. For example, a M5 (5 m) Levelogger Edge or AquaVent have a typical accuracy of ± 0.010 ft. (±0.3 cm), while the Levelogger Edge M30 (30 m) has a typical accuracy of ± 0.064 ft. (±1.5 cm). With absolute Leveloggers, you have to take into account any inaccuracies in both the level sensor and separate barometric sensor when looking at the final water level data, even in shallow applications. Generally, an AquaVent can provide more accurate water level data in shallow applications, when it is is placed close to the surface. The deeper you go, or the higher the water level fluctuation, it is recommended to use a Levelogger. Vented transducers may be subject to slow responses to small changes in barometric pressure when submerged to greater depths. Usually, depending on local requirements, the length of the pumping test is pre-established and the frequency of water level measurements set. Leveloggers and the AquaVent can be programmed with a customized sampling schedule to match the predetermined sampling rates. Scheduled sampling sets the rates at which the water level data is collected for a number of separate intervals, allowing the typical logarithmic-style sampling schedule to be set. You can customize a program to record water levels before, during, and after the pumping test (baseline, pumping, and aquifer recovery). Recording aquifer recovery and return to baseline values is often considered the most valuable part of any pumping test, especially for determining aquifer transmissivity. It is recommended that a Levelogger be installed on a Direct Read Cable in the pumping well for real-time, constant communication. Set it above the pump to minimize interference from the pump motors and turbulence. In neighboring observation wells, suspension line deployment is suitable, and saves costs. The AquaVent features a thick-jacketed vented cable; as such, installing along side a pump should not cause any interference. Prior to pumping, a manual depth to water measurement (with date and time) should be recorded from each well (using a Solinst Model 101 or 102 Water Level Meter). This data can be used to ensure the dataloggers are recording properly. Taking periodic water level measurements is a good idea throughout the pumping period. The initial water level readings can also be used to adjust all pressure readings in a logged file, to express the data as depth to water or elevation values. 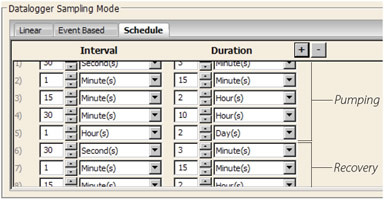 You can use the "Manual Data Adjustment" option in the Levelogger Software, and input the manual readings. When using a Levelogger with a Direct Read Cable, or an AquaVent, real-time readings independent from recordings set in the schedule can be viewed and saved during the pumping test. Real-time readings can be recorded using Levelogger Software or the Solinst Levelogger App on your smart device, without disrupting the previous set recording rate. Once the Levelogger and Barologger data is downloaded to Solinst Levelogger Software, the "Data Wizard" can be used to barometrically compensate the data, and adjust it to depth measurements. Multiple Levelogger files can be barometrically compensated at once using one Barologger file. Again, barometric compensation is not required for AquaVent data. However, the "Data Wizard" can be used to adjust the data to depth measurements. You can view your data directly using Levelogger Software, or it can be exported in a standard .csv or .xml format for use in any hydrologic software for further analysis and interpretation.